Federico Hurtado has achieved with Torquay what many believed should have been achieved a year earlier: promotion. 6 points clear of title rivals Maidenhead, Torquay United have returned to the Conference after two years down in Tier 6 of English football. 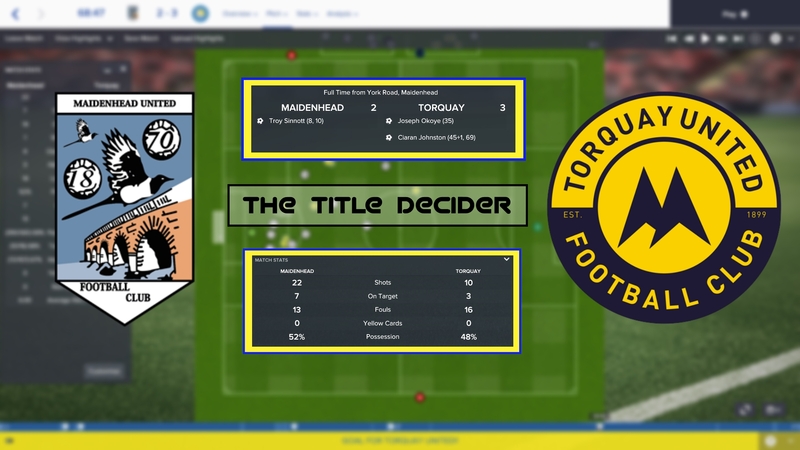 In the previous post, we saw how Torquay lost narrowly in the Playoff Final against Maidstone, and so to be able to win the league and earn promotion outright was the definitive aim for Hurtado’s second season in charge. Six points may seem like a comfortable distance away from the team below, but it was everything but comfortable when Torquay came up against Maidenhead in a huge game towards the end of the season. Maidenhead came into the game knowing that a win would see them draw level on points with Torquay with just a few games left in the season. The home side led 2-0 after just ten minutes through a brace from Troy Sinnott, but Torquay fought back to be on level terms at the break. Despite Maidenhead’s dominance, we were able to counter attack effectively and in the 69th minute they scored the winner. Torquay United were confirmed champions with one match remaining. A defeat would have resulted in an entirely different outcome. Federico Hurtado was applauded in the previous post for changing formation mid-season, with stats vindicating his decision. Therefore many pundits questioned the return of the 4-4-2 in the opening fixture of the 2040/41 season. Why did Federico revert back to the 4-4-2 and was it a success? Last year Torquay lacked firepower in attack and this was something that Hurtado wanted to change in between seasons. No players were sought out specifically to add this firepower; instead, a change in formation was implemented. And this 4-4-2 certainly improved Torquay’s fortunes in attack. We scored, on average, 1.86 goals per game. However, we didn’t have as good a win percentage (albeit by just one percent) and conceded more goals per game. 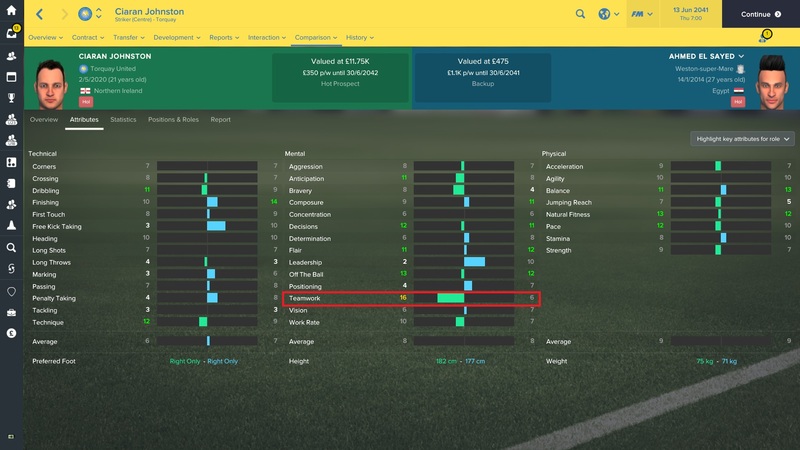 So why was the 4-4-2 a more effective formation? Torquay were able to turn losses into draws and draws into wins. Where last season we would lose by one goal, this season we would draw that game and earn a point. Our improved attacking threat allowed us to pick up more points despite playing poorly or being outplayed. Why was this current 4-4-2 better than last years? The roles used in the current 4-4-2 are largely the same as the ones used in last years version. However two players brought into the side this year have transformed the success of the formation and allowed us to use an extra striker in place of the defensive midfielder. If you take a look at both of these players you may think that El Sayed would be the better option. It is certainly what Federico Hurtado thought in his first year with Torquay. But having seen El Sayed fail in his only season with the club, Hurtado decided to give Johnston a go in the deep-lying forward role. His high rating in teamwork could well be a massive factor in his effectiveness as he went on to score 19 goals and assist 14 in an incredible partnership with Reise Bailey. The second, and perhaps most crucial, difference is the addition of potential Torquay legend Joseph Okoye. Playing in the ball-winning midfielder role, Joseph Okoye is a vast improvement on the two players we used in this role in last seasons 4-4-2. Okoye has proved a very good player and will continue to improve in the years to come. Looking ahead to the 2041/42 season back in the Conference, Torquay’s board want survival. Federico Hurtado is aiming for mid-table. We need to look to build for the future as we aim to earn promotion to the Football League within three years. Joseph Okoye is crucial to this as he could well develop into a solid League Two standard player, meaning contract talks should be a priority for Hurtado. It’s looking set to be a busy summer ahead for Federico Hurtado, will he be able to build on his success? Thanks for reading, I hope you enjoyed! If you did, be sure to follow the blog to make sure that you stay updated with our series and more Football Manager content!